Awhile ago, I had a somewhat high blood sugar score on a test. It wasn’t a fasting test or anything, so I don’t know how accurate it was, but in the past year, it was higher than my last one, and that one was higher than the one before that. Diabetes runs in my family, and as I get older, I find that I’m more sensitive to sugar (and caffeine and alcohol!) I also was borderline for gestational diabetes when I was pregnant. For all these reasons, I decided to do an experiment over the last couple of months and greatly reduce my sugar intake. I haven’t cut it out completely, and I occasionally have dried fruit (but not much) and bananas, and all the other high glycemic index fruits (apples, watermelon, etc.) But I have cut it out A LOTI’ve since realized that I used to eat a lot of sugar — I have such a sweet tooth. But if I have a taste of something now that’s high in sugar (the other day I sampled a bite of a gluten free blueberry muffin sample at Trader Joe’s and had to throw the rest away), it tastes TOO sweet. I do sweeten my coffee with stevia and I chew sugar free gum, so I haven’t shunned all sweet things though. I’m just trying to do things in moderation. I find I need less sweetener in my coffee now than I did before though. I will probably have another blood test in a week or two, so it will be interesting to see if my levels have been affected by the change in my diet over the last three months or so. A new moniker that keeps popping up in health news these days is “Super Food” — have you noticed? I haven’t been paying that much attention, because I tend to eat a lot of them anyway: green leafy vegetables like kale, blueberries, oats, broccoli, walnuts, salmon, spinach, chia seeds, avocados, coconut oil, eggs, etc. I haven’t gone out of my way to sample some of the more exotic super foods, like acai berry, camu camu, maca, lacuma, spirulina, or even wheat grass. 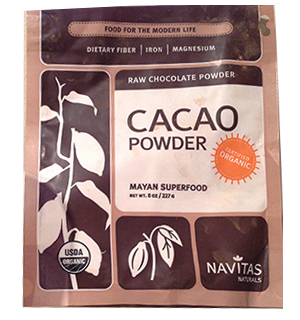 But I keep hearing about raw cacao powder — cacao is the portion in chocolate that has all the antioxidants and is rich in minerals. I’ve even read that it helps to lower insulin resistance. It appeals to me because I love chocolate, and since I have stopped eating a lot of sugar, I find I even love eating unsweetened chocolate (to my son’s horror). I decided to buy a bag at our local health food store and try it out for myself. It definitely tastes “more chocolatey” than regular unsweetened cocoa. The result was really great! It is very easy to make as well. 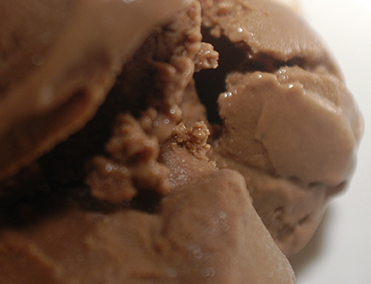 You just process a package of Silken soft tofu, cocoa powder, agave syrup (or other sweetener), and some vanilla in a food processor and then churn in an ice cream maker for about 10-15 minutes (it is much faster than making regular ice cream, perhaps because of the low fat content). Let it harden in the freezer. The longer the tofu melds with the other flavors, the better it tastes. 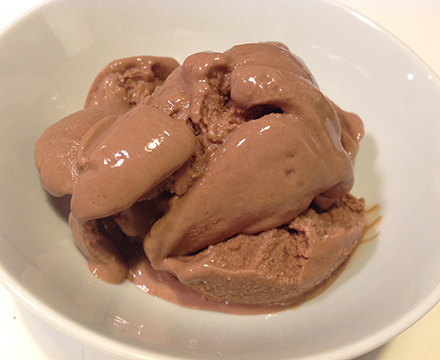 There you have it — dairy free, chocolate tofu ice cream that is high in anti-oxidants and low in calories! 🙂 Note, my batch is not as sweet as the kind you buy in the store, but I prefer it that way. If you want a sweeter version add more sweetener or make with 2/3 cup chocolate chips melted with 1 tablespoon water — I have made it this way too in the past before my sugar concerns, and it is very delicious! 1. Process all ingredients in a food processor until silky smooth, stopping to scrape down edges midway through. 2. Churn in an ice cream maker according to manufacturer’s instructions for about 10-15 minutes. I had forgotten that I awhile back I did this submission for Tofu 3 Ways, for the awesome site, They Draw and Cook. The Tofu Mousse recipe in the illustration is similar — but not sugar free. Still, this would be good also when churned frozen in an ice cream maker! I recently read Mark Bittman’s Food Matters: A Guide to Conscious Eating with more than 75 Recipes. Along the lines of Michael Pollan’s The Omnivore’s Dilemma, it chronicles the many ways in which the way we eat is damaging to both our bodies and the environment. But it also offers concrete advice in the form of easy, nutritious recipes that you can incorporate into your diet. His mantra is basically: Eat less meat. Eat less animal products. Eat very little processed food. Eat a lot of plants. I always enjoy his recipes because they are written to be experimented with — nothing is set in stone, and he always gives tips on how you can change things up to suit your tastes. The biggest thing I took away from the book is that I was inspired to start cooking more whole grains other than wheat and oatmeal. 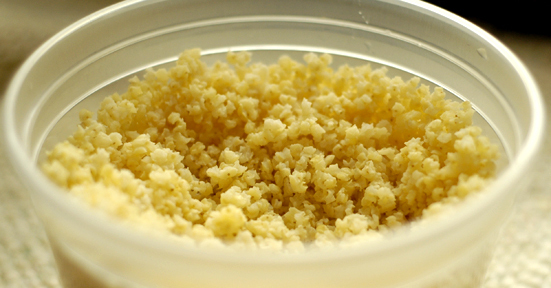 Looking in my pantry and refrigerator, I found that I already had bulgur wheat and millet from who knows when! I actually use bulgur wheat semi-regularly to make tabouleh whenever I have extra parsley on hand. Don’t you hate it when a recipe just calls for a “few sprigs of parsley”? Then you are left with a bunch of parsley that you forget about that gets wilted and worse, slimy, in the vegetable bin. To avoid this unfortunate situation, I try to wash all the parsley at once when I come home from the green grocer, use what I need, and then use the rest to make Tabouleh. This time I decided to make it crunchy and add some nutty flavor and protein and threw in some almonds. It was a really great combination. You could also add cucumber, scallions, grilled chicken, grilled shrimp, chopped olives, other herbs, such as mint. 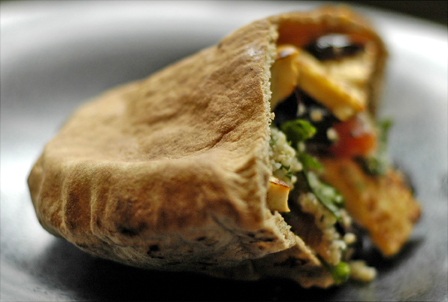 I made it my lunch and stuffed it in a pita pocket with a few fried slices of tofu and chopped olives. The flavors actually worked well together! As for the millet, I decided to cook up a batch and come up with a way to use it later. Millet is high in protein and gluten free, so it’s a good grain choice for people who are gluten sensitive. I like the texture — it is kind of like small rice grains. I incorporated it into a couple of breakfasts — both savory and sweet, and also ate for lunch with some leftover vegetables and marinara sauce. It is quite versatile! For the savory breakfast, I scrambled an egg, heated the millet in the skillet with a bit of water to soften it, and then threw them together in a bowl. 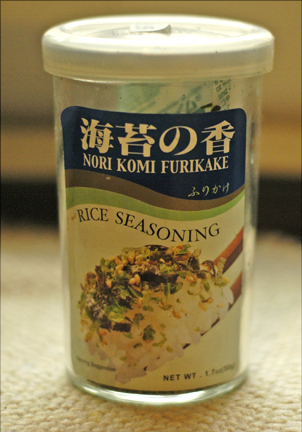 I seasoned it with a bit of Japanese seasoning I had on hand, called Furikake. It comes in different flavors. This one is just salt, sesame seeds and seaweed. You could probably make your own if you have nori (dried seaweed) and sesame seeds on hand. The sweet breakfast was heated millet mixed with a dash of agave syrup, thawed frozen blueberries, and toasted chopped pecans. SO delicious. 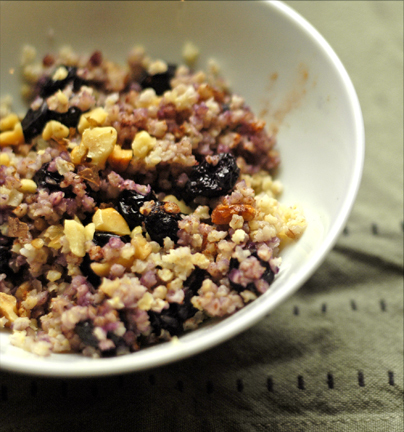 Millet is a nice alternative to oatmeal in the morning — it is chewier and not “gloppy” if you are not in the mood for that texture for breakfast. I’ll keep experimenting with it and try it out in different dishes. There are also a wide variety of different grains to try: amaranth and quinoa, pearl barley — there are so many I have never worked with before! What are your favorite grains and grain dishes? 1. Rinse the grain in a strainer, and put it in a large pot with a tight-fitting lid along with a big pinch of salt. Add enough water to cover by about an inch; if you want the grains on the dry side, cover with closer to 1/2 inch of water. Use 3 cupt water for pearled barley. Bring to a boil, then adjust the heat so the mixture bubbles gently. 2. Cook stirring once in a while, until the grain is tender. This will take as little as 7 or 8 minutes for steel-cut oats, about 40 minutes for brown rice, and as long as 1 hour for more for wheat berries, hulled or unpearled barley, and other unhulled grains. Add boiling water as necessary to keep the grains just submerged — don’t let them get dry. 3. Every now and then test a grain. They are done when they are barely tender and have some chew. If the water is all absorbed at this point, cover and remove from heat. If some water still remains, drain and the grains and immediately return to pot, cover and remove from the heat. 4. Toss with oil if you like and refrigerate or freeze until ready to use. Bulgur: Pour 5 cups boiling water over 2 cups bulgur. Stir once and let sit. Fine bulgur will be tender in 10 to 15 minutes, medium in15 to 20 minutes, and coarse in 20 to 25. Strain using a fine mesh straining, pressing down with a spoon to remove excess water. Return to bowl and fluff with fork. Couscous: Put 2 cups of couscous in a pot with a tight-fitting lid and add 3 cups of water and pinch of salt Bring the water to a boil, then cover and remove from heat. Let steep for 5 to 10 minutes (10 minutes for whole wheat), or up to 20. Fluff with a fork and serve. 1. 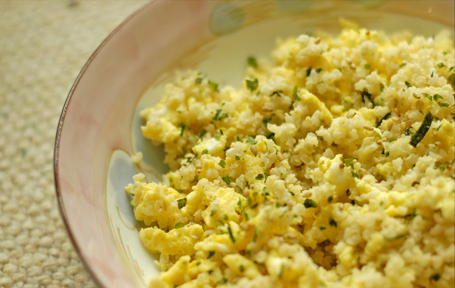 Place bulgur wheat in a medium sized bowl. Boil 2 cups of water. When it comes to a boil, pour over bulgur wheat and let sit about 10 minutes. Drain in a fine mesh sieve, pressing down with a wooden spoon to remove excess water. Transfer to a large bowl and fluff with a fork. 2. 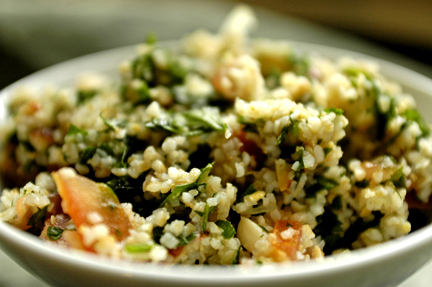 Add parsley, onion, and tomato to bulgur. Season with a pinch of salt and toss to combine. 3. In a small bowl, whisk lemon juice, olive oil, and salt and pepper to taste. Pour over bulgur mixture. Fold in almonds. Serve immediately. Note, if you want almonds to stay crunchy, only add as needed at one serving.